Soybean producers frequently must assess a field of soybeans that did not emerge properly or were damaged early in the season to determine if replanting is necessary. Replanting a failed or poor crop is sometimes an option, but can be a difficult decision. Factors to consider in making a replant decision include calendar date, cost of replanting, soil moisture, anticipated weather, and labor restraints. The decision to replant must be weighed against doing nothing or accepting the yield that is likely to occur from the original stand. In order to do this the producer must know the probability of realizing a higher yield with replanting. The potential yield of a late-planted crop must be known in order to make sound economic and agronomic decisions. Questions frequently asked by soybean producers are: When is the earliest or latest soybeans can be planted? When during the planting season should we switch to an earlier maturity variety to prevent losses from killing frosts? When should a grower consider replanting soybeans? Soybean growers in southern Wisconsin generally plant soybeans after corn planting in early to mid-May. However, cool wet weather is not uncommon and can inhibit emergence and early soybean growth. Planting later generally results in better soybean emergence and stands. Soybeans planted in no-till and conservation tillage situations are also more prone to disease and poor emergence due to cooler soil temperatures. When soybeans fail to emerge or when the stand is spotty, producers may need to replant all or part of a field. Deciding to replant soybeans is not easy, but a quick decision is necessary since yields decline with later planting. In addition to stand assessment and the predicted yield with and without replanting, other considerations are machinery availability, seed availability, alternative crops, herbicide cost and herbicide carryover concerns. The first step in determining if replanting is necessary is to determine stand density. Soybean stands should be evaluated on the actual established population and its general appearance and health. Frost, herbicide, machinery, or diseases may weaken live plants and cause plant death later in the season. Soybean plant density can be determined by counting plants in several areas of the field and adjusting to a per acre basis. Table 1 can be used to estimate yield of the current stand and that of a replanted stand. Table 1. Expected relative soybean yield at four replanting dates compared to predicted yields for a range of plant populations resulting from an optimum planting date of May 1 – 20 for full season maturity or short season maturity * varieties. * Figures in italics are for shorter season maturities. Table 1 shows expected yields for various planting dates and early populations in Wisconsin. Use the early population rows and planting date/variety maturity columns to see if the expected yield of a replanted stand would be higher than the expected yield of the existing stand. The actual early population is dependent on several factors, especially seeding rate, germination and emergence %. If the expected yield of replanting is higher than doing nothing, producers should also add in the cost of seed, machinery, and labor to replant. There is also risk in replanting since the standard yield of the replanted stand depends on factors beyond the control of the producer. When is the latest soybeans can be planted in Wisconsin and still expect a grain yield? Recent research in southern Wisconsin indicates that in two out of three years, grain can be harvested from soybeans planted as late as June 26, although the yields are usually minimal and not generally economically feasible. The frequency of harvesting grain from soybeans planted this late can be increased by using early maturing varieties (<1.8RM) in southern Wisconsin, and <1.0RM in northern production areas. A planting date of June 20 in southern Wisconsin and June 15 in northern Wisconsin, using early maturing varieties, is considered to be the latest practical date. 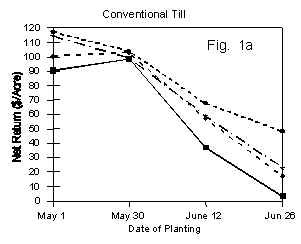 When no-till production techniques are being used, the latest planting dates must be moved 4 to 5 days earlier. When during the planting season should a producer switch to an earlier maturing soybean variety? In southern Wisconsin, full season soybean varieties (>1.8RM) out yielded earlier maturing varieties (<1.8RM) by 15% at early May planting dates compared to only 2 to 5% at end of May planting dates. In northern Wisconsin, late maturing varieties (1.7 to 1.9RM) also out yielded early maturing varieties (<1.7RM), however the difference was not as great. Switching to an earlier maturing variety when planting after the first week of June will reduce the chance of damage from an early fall frost. Can increased seeding rate compensate for late planting? Profitable soybean production in no-till and conventional till systems requires adequate soybean stands entering the grain filling period. Although soybeans have the ability to compensate for some low population situations, final plant stands are a direct result of seeding rates. Final harvest plant populations are generally only 40-70% of original seeding rate. 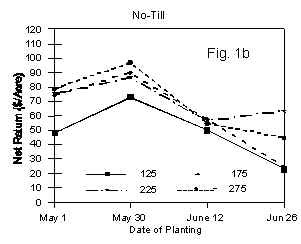 Later planting dates favor higher emergence rates and overall plant survival. Soybeans seeded in conventional till generally have higher emergence rates but growing season survival is similar to no-till. Recent research conducted in southern Wisconsin showed that planting at 275,000 seeds/acre produced the highest net return (total gross income minus all costs) at all planting dates in conventional till systems (Fig. 1a). In no-till, the 275,000 seeding rate produced the highest net return at the May 1 and May 29 planting date. After June 12, 225,000 seeds/acre showed the greatest net return (Fig. 1b). Thus, maximum yields were achieved with the highest seeding rate and we found no economic benefit in using lower seeding rates regardless of the planting date.